stretches further & reaches higher than our boundaries can contain. Guaranteed. Funding for a summer internship or research fellowship. Study abroad for a semester at no additional tuition cost. Graduate in four years. 98 percent of our graduating class are employed, in graduate school, or participating in a fellowship or service commitment within six months of graduation. Welcome movers, shakers, dreamers, explorers, and soon-to-be lifelong friends. Our name for Sewanee's 13,000-acre campus—boundless opportunities for research, recreation, applied learning, and reflection. Your first official act as a Sewanee student is to sign the Honor Code and pledge to live honorably. In that spirit, we introduce the Sewanee Pledge, our promise to you. 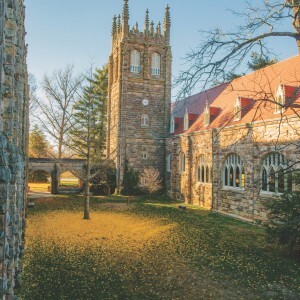 Sewanee has taken a leading role in making a first-rate education more accessible, making scheduling and advising more personal, and making honor central to life on the Domain. Now, we have deepened our commitment by adding new guarantees for new students. We pledge—to help Sewanee graduates secure good jobs and spots at top graduate programs by providing funding for a summer internship or research fellowship. 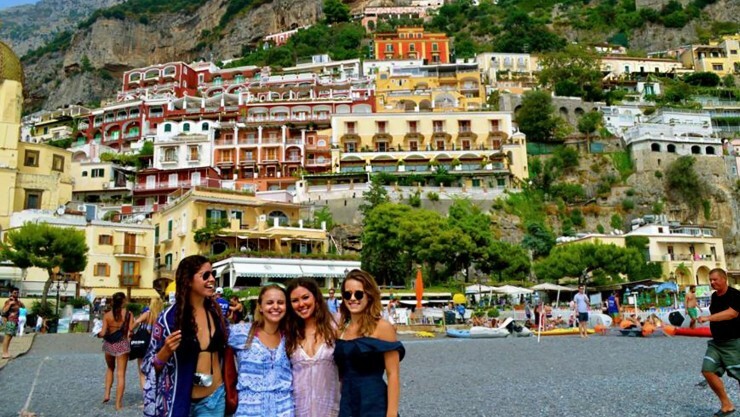 We pledge—to help Sewanee graduates find their place in an increasingly interconnected world by providing you with access to a semester-long study-abroad program at no additional tuition cost. We pledge—that you will graduate in four consecutive years (with one major). If you do not, Sewanee will provide up to one additional year of study tuition-free. Of course, you will have to do your part, too. 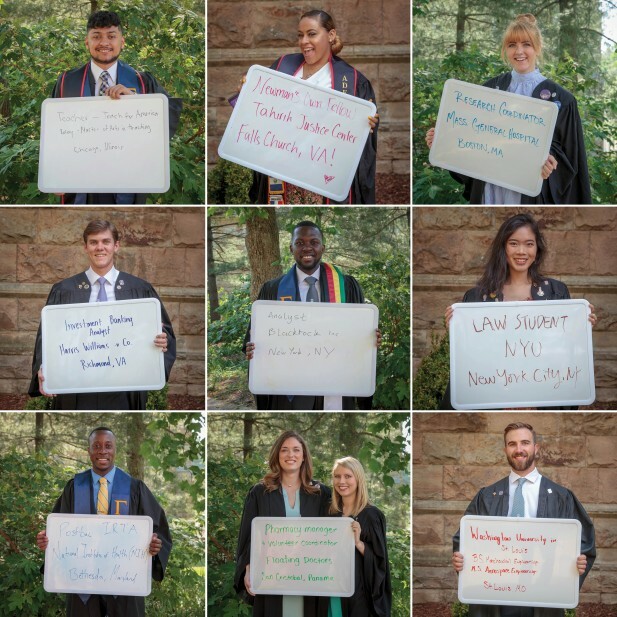 But if you meet Sewanee’s academic and social expectations, we pledge—we guarantee—to make these opportunities available to you. 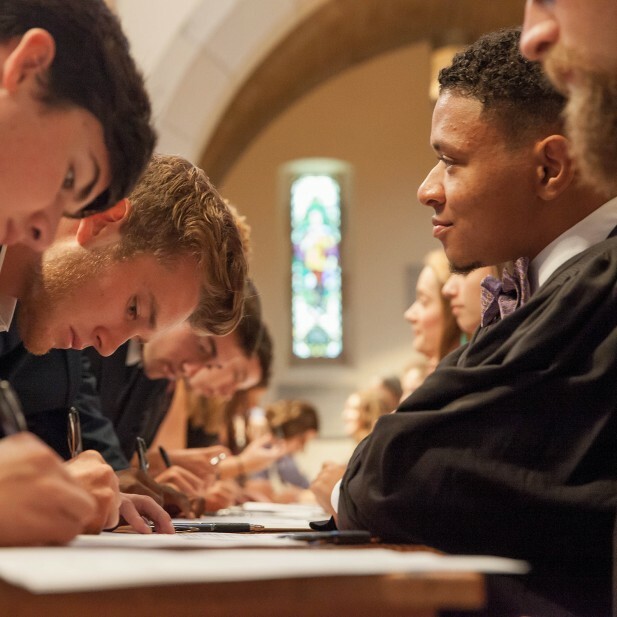 The Sewanee Pledge takes its name from our Honor Code ceremony, wherein first-year students sign a document pledging not to lie, cheat, steal, or harm one another during their time as a Sewanee student. The Code allows our students great freedom in the classroom and around campus, but comes with responsibility, too. It's this two-way street that inspired our promise to Sewanee students. Now, Sewanee students are guaranteed funding for a summer internship or research fellowship, a semester-long study-abroad opportunity at no additional tuition cost, and the ability to graduate with one major in four years. If you pledge to do something cool, we pledge to cover the rest. At Sewanee, you have the opportunity to go to all seven continents (yes, even Antarctica). The world is becoming increasingly interconnected. We pledge that you will have the opportunity to spend a semester learning more about it. You will get real-world, hands-on, career-shaping experiences during a summer internship or research fellowship. We pledge to give you an opportunity to spend a summer gaining a better understanding of yourself and the gifts you have to offer. Do your part, and we pledge that you will graduate in four years. If not, Sewanee will provide up to one additional year of study tuition-free. Are other schools promising you that? We didn’t think so. YES, THE WORLD IS BIG, BUT IT’S ALSO INCREASINGLY INTERCONNECTED. 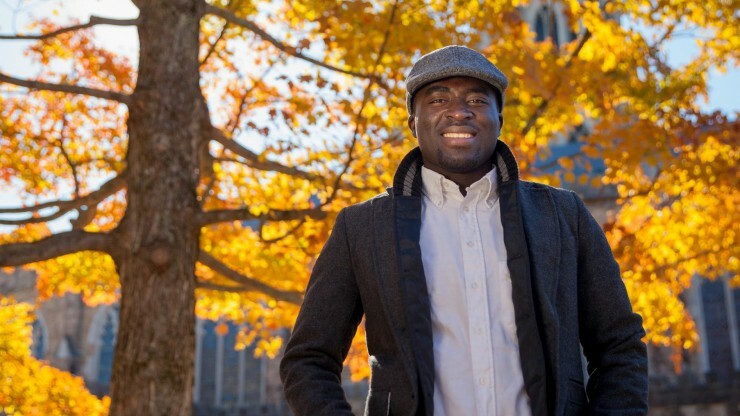 LEARN HOW SEWANEE PREPARES STUDENTS FOR LIFE AS ENGAGED GLOBAL CITIZENS. 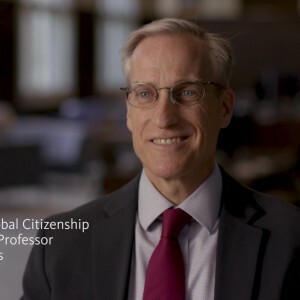 The Office of Global Citizenship connects Sewanee students with the world. Are you interested in studying abroad or an international internship or research fellowship? We can help you find the program (and the fascinating international destination) that’s perfect for you. Your voice will be heard, your contribution will be expected, and your opinion will be considered (and disagreed with, and challenged, and seen from a different perspective, and pushed in a new direction—and you know what? Maybe we’re both right. See how it works?). About 95 percent of Sewanee graduates who apply to law school are accepted. More than 85 percent of our recommended pre-health graduates are accepted to medical school (that’s more than double the national average). Sewanee's not an environment where a professor stands up and lectures while hundreds of students scratch out notes. It's a place where everybody stands up for what they think and what they believe in. Don’t forget to bring something interesting to say. Sewanee graduates get going. 98 percent of our most recent graduating class are employed, in graduate school, or participating in a fellowship or service commitment within six months of graduation. 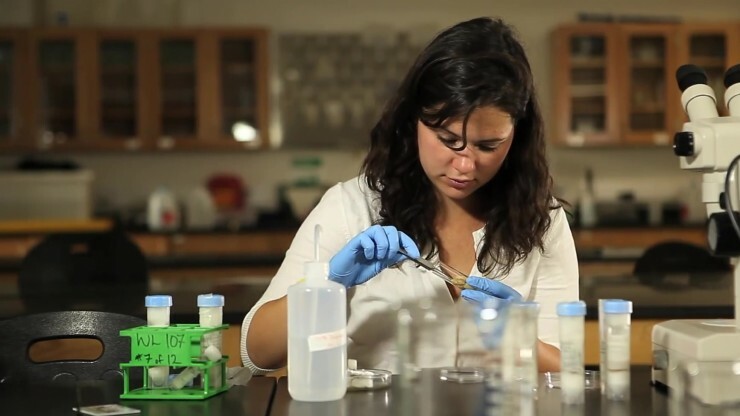 Sewanee’s undergraduate research program gives students the opportunity to explore new ideas, sharpen their research skills, and get a head start on a career or graduate school. Almost a quarter of students here were involved in mentored research projects last year, in the sciences (of course)—but also in the arts, English, politics, and more. Students have the chance to wow their peers by giving talks and presenting posters during Scholarship Sewanee, the annual celebration of student scholarship and creativity. 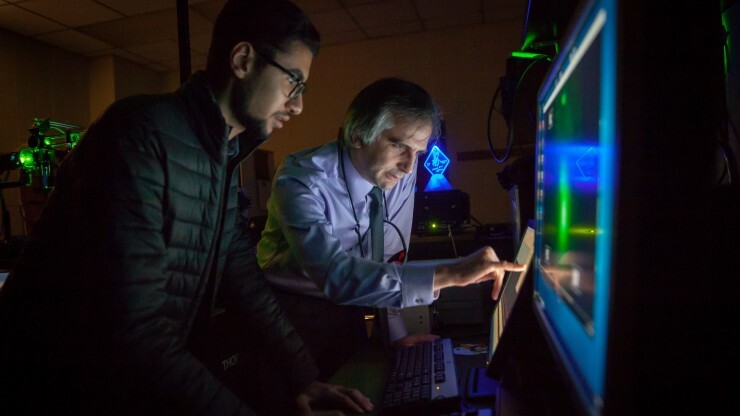 Physics professor Eugenii Donev and his students have put together the tools needed to make and study the properties of many substances at the nanoscale, and these students have presented posters on their discoveries (“Nanoscale Patterning Laser Interference Lithography,” anyone?). Or maybe in-depth study of new anti-cancer pharmaceuticals sounds more appealing. Or the effects of missionary work in the South; local bat habitats; the gender wage gap; or the influences of tourism on Havana restaurant food sourcing? 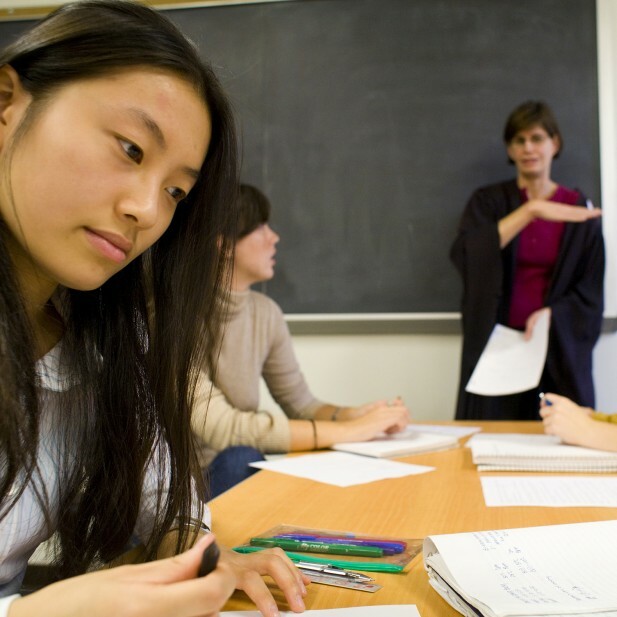 Students dove deep into all of these topics and dozens more last year. Sewanee's Finding Your Place (FYP) program introduces new students to intellectual, social, and community engagement projects even before their first semester on campus starts. The program builds skills for academic success and civic potential by bringing students and faculty together in an immersive environment. At Sewanee, you learn by doing, so participating in undergraduate research and civic engagement isn’t too much of a stretch for students like Lauren. We promise to point you in the right direction after graduation. We will have prepared you—in the classroom and out—so it'll be time to go out and see the world up close and professional. Here you’ll get to test-drive your skills in a real-world setting, build your network, and contribute to a team—all while perfecting qualities that employers find irresistible. Last summer, Sewanee students received nearly $600,000 for unpaid (or underpaid) internships and research assistantships in a wide variety of fields and disciplines. Sewanee students were spread all over the country (and the world) for their summer internships and research assistantships. Over 250 students take advantage of Sewanee’s funding for summer internships and research assistantships with leading companies and organizations. Sewanee typically provides more than 250 students with nearly $600,000 in funding for otherwise unpaid internships and research fellowships each summer. 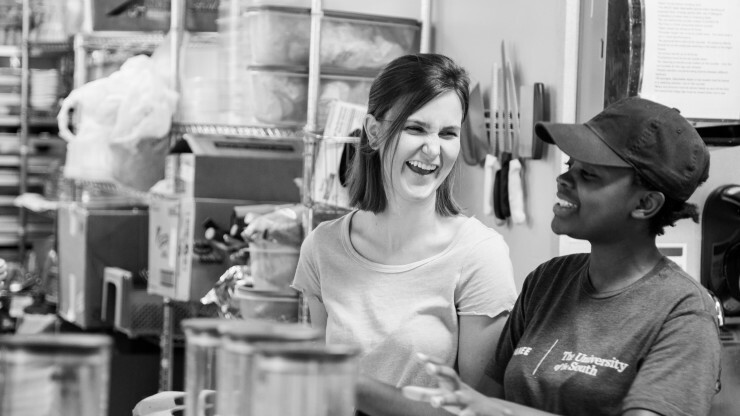 This support allows Sewanee students to gain the experience, the skills, and the connections they need to help them succeed right out of college. In fact, our graduates often secure positions as a direct result of their position or through a network developed during the summer. What’s more, as part of the Sewanee Pledge, every new Sewanee student is guaranteed access to one summer opportunity during their four years. Meet a handful of Sewanee students who gained valuable experience through Sewanee-supported internships. Most Sewanee graduates end up doing the same thing: exactly what they want to do with their lives. 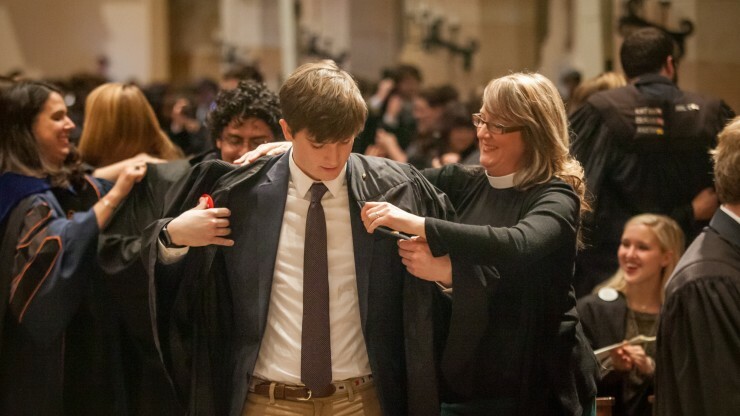 Sewanee graduates spread their wings. Spain, France, New Zealand, and China were among the most popular international destinations for our recent grads. They also found spots in Bhutan, Denmark, and Japan—just to name a few. We hope they send pictures. Sewanee graduates mean business. 37 percent of our recent graduates went into business, finance, or consulting. 10 percent went into government, politics, policy, and law; healthcare, medicine, and research; arts, publishing, media, sports, and entertainment. The Sewanee experience accompanies you beyond the gates. We’re finding that our recent graduates are doing some impressive things on the other side. For these alumni, success has taken many shapes and has taken them many places. From farming to finance, their career outcomes are exciting to see. Get to know some of our young alumni—we think they’re pretty amazing. We're a community where everyone has a place and there's a place for everyone. Group study? We'll bring our notes. Rock climbing? We're geared up and ready. Jam session? Sure, we'll play with you. Whatever you want to do, at Sewanee, you'll never have to go it alone. Unless you need your space. Then, we totally get it. Where will I live? What's going on? What's to eat? You've got questions? Almost all students live on campus. During your first year, you will live in one of our 19 residence halls. Later, you can also chose from five language houses, several theme houses, a women's center, and a hall for our student firefighters (that's right you can train to fight fires, and build houses, too, but more on that later). When you go down the list of amazing clubs & organizations at Sewanee, please heed these two words of advice: pace yourself. With club sports, honor societies, art & publication organizations, student government, and emergency services, you'll find at least one thing (or 20) you want to join. A Cool Sewanee Morning. A Crazy Sewanee Night. An Iced All Saints' Chapel. These are just a few of drinks available at Stirling's Coffee House—our student-run coffee house. An extension of Sewanee Dining, Stirling's is a perfect spot to grab a bagel or just hang out in one of the big comfy couches. Oh, and try our renowned curry chicken salad salad ... yum! Belonging is connection. It’s mattering. It’s thriving. 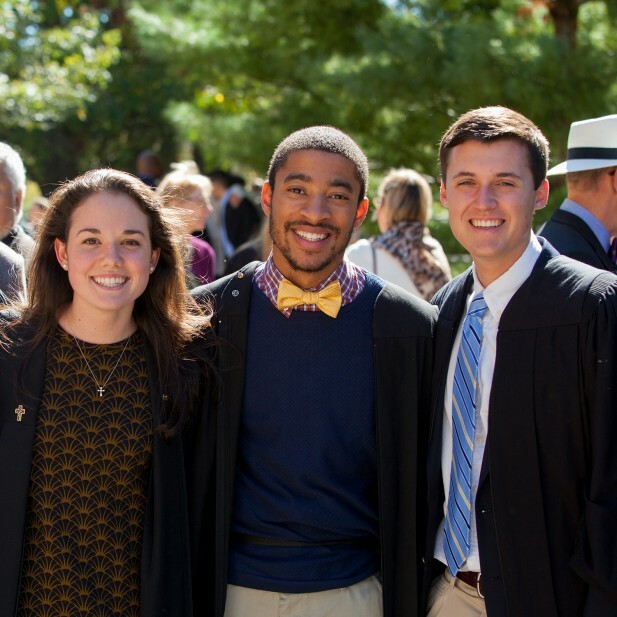 At Sewanee, we’ve created an environment to foster this sense of belonging. We also know that there is no finality to belonging—it’s continual and evolving. That’s why we’ve built a community full of diverse people whose goal is to walk alongside you no matter what. Have a look at some of the real-life people you’ll meet here on the Mountain. They were once where you are now—looking for a new community. See what these folks have to say about their experience. They are actively creating a space for you. 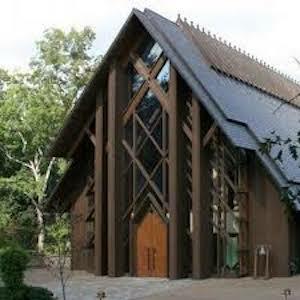 Come visit to see if Sewanee is where you belong. 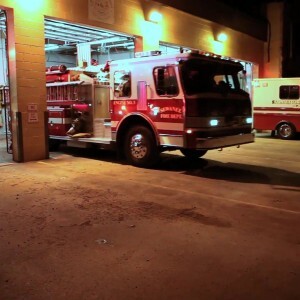 As one of only two student-involved volunteer fire departments in the country, SVFD offers a unique opportunity for Sewanee students to serve their community. Tryouts occur each spring and are open to all first-year students. Since its formal organization in 1951, the Sewanee Volunteer Fire Department (SVFD) has served the University community and the neighboring areas of Sherwood and Monteagle with a team of highly-trained local residents and students. Sewanee’s flourishing civic engagement program reaches beyond the Domain to prove that a crucial part of preparing students for success is giving them opportunities to interact meaningfully with the communities and people around them. We envision a Sewanee where students learn to engage this place and make meaningful change. We offer a constellation of opportunities for students including internships, academic certificates, volunteer opportunities and courses. The Office of Civic Engagement facilitates partnerships between campus and community members to develop relationships, knowledge, and skills that improve our common life across the South Cumberland Plateau. Do·main (dō-meyn') noun. 1) A wooded laboratory filled with diverse ecosystems; useful for research, a tool for answering real-world questions. 2) A recreational oasis; an outdoor playground naturally equipped with trails to hike, rocks to climb, etc. 3) Your new home. 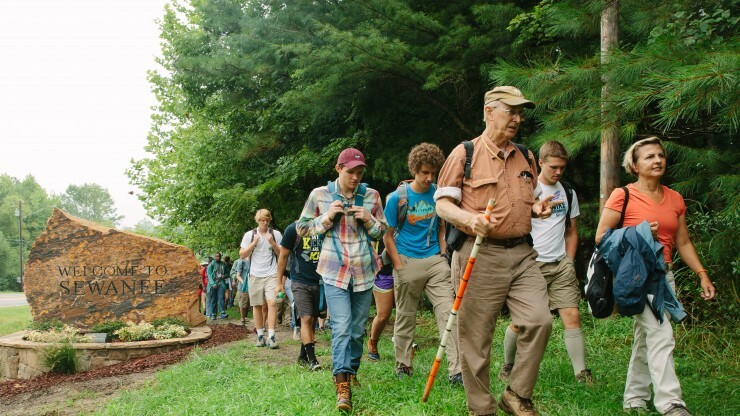 Sewanee's Integrated Program in the Environment is one of the premier collections of environmental offerings in the country. A working farm, a 13,000-acre forest, and well-funded internships offer opportunities to apply your classroom learning. The Domain is home to an extensive trail network. The signature Perimeter Trail—the 19-mile loop that circles much of the Domain—is a must for your Sewanee bucket list. It provides a hiking experience unparalleled in the region. Try one of our favorites. The University Farm supplies McClurg Dining Hall, Stirling’s Coffee House, and the Cup & Gown Cafe with over one ton of product annually, including fresh eggs, salad greens, and other produce. 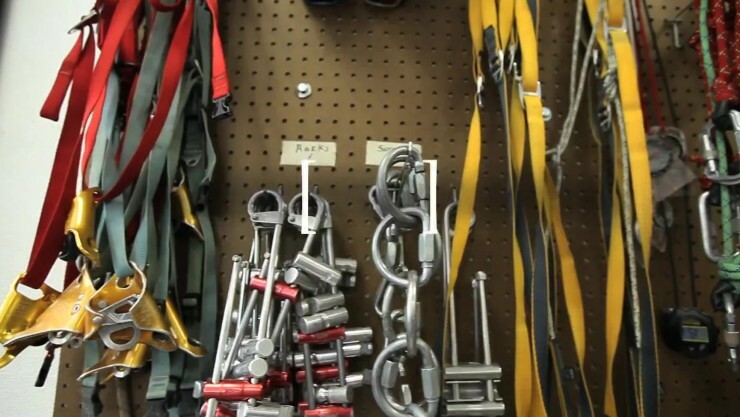 Want to get your hands dirty? Labs, research, independent study, and social events are just a few ways to get down on the farm. 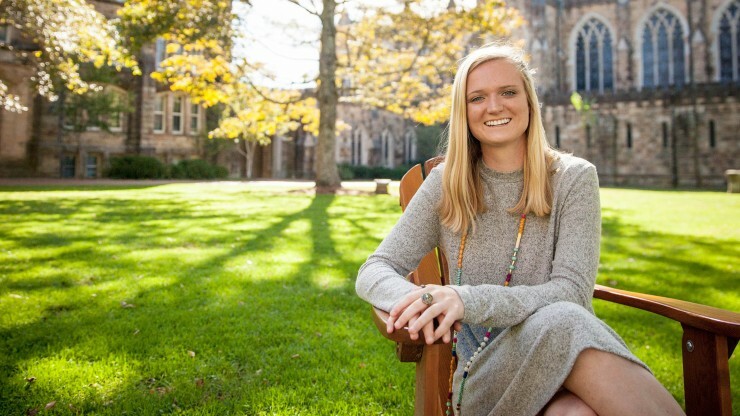 "If you're a student who is interested in being outside and studying the natural world and being able to do that at any time, Sewanee is the place for you." 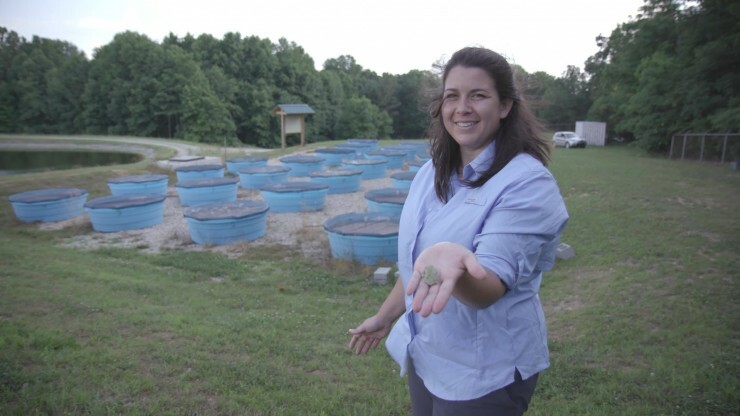 Professor Kristen Cecala is interested in how environmental change alters the ecology and distribution of amphibians and reptiles through behavioral mechanisms. On SOP trips, students learn valuable leadership and technical skills while gaining a greater appreciation for the natural world. 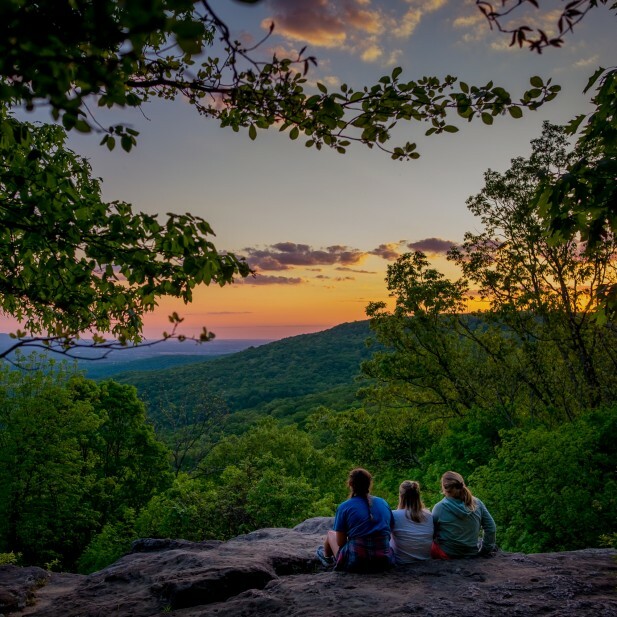 The Sewanee Outing Program (SOP) gives students the chance to explore Sewanee’s 13,000-acre campus, the surrounding region, and wilderness areas across the United States. 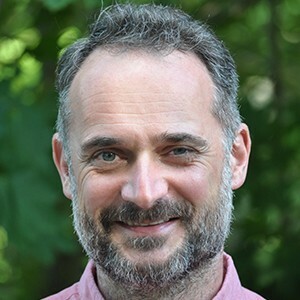 In his book The Forest Unseen, Biology Professor David Haskell uses a one-square-meter patch of Sewanee's old-growth forest as a window onto the entire natural world. His writing brings the forest and its inhabitants to vivid life. Read an excerpt below. A polar wind rips across the mountainside, streaming through my scarf, pushing an ache into my jaw. Not counting the wind chill, it is twenty degrees below freezing. In these southern forests such cold is unusual. Typical southern winters cycle between thaws and mild freezes, with deep chills arriving for a few days each year. Today’s cold will take the forest’s life to its physiological limits. I want to experience the cold as the forest’s animals do, without the protection of clothes. On a whim, I throw my gloves and hat onto the frozen ground. The scarf follows. Quickly, I strip off my insulated overalls, shirt, T-shirt, and trousers. The first two seconds of the experiment are surprisingly refreshing, a pleasant coolness after the stuffy clothes. Then the wind blasts away the illusion and my head is fogged with pain. The heat streaming out of my body scorches my skin. A chorus of Carolina chickadees provides the accompaniment to this absurd striptease. The birds dance through the trees like sparks from a fire, careening through twigs. They rest no more than a second on any surface, then shoot away. The contrast on this cold day between the chickadees’ liveliness and my physiological incompetence seems to defy nature’s rules. Small animals should be less able to cope with the cold than their larger cousins. Small animals cool rapidly because they have proportionally much more body surface than body volume. The relationship between the size of animals and the rate of heat loss has produced geographic trends in body sizes. When an animal species exists over a large area, the individuals in the north are usually larger than those in the south. This is known as Bergmann’s rule, after the nineteenth-century anatomist who first described the relationship. Carolina chickadees in Tennessee live towards the northern end of the species’ range, and they are ten to twenty percent larger than individuals from the southern limit of the range in Florida. Tennessee birds have tipped the balance between surface area and body volume to match the colder winters here. Farther north, Carolina chickadees are replaced by a closely related species, the black-capped chickadee, which is ten percent larger again. Bergmann’s rule seems remote as I stand naked in the forest. The wind gusts hard and the burning sensation in my skin surges. Then, a deeper pain starts. Something behind my conscious mind is trapped and alarmed. My body is failing after just a minute in this winter chill. Yet, I weigh ten thousand times more than a chickadee; surely these birds should be extinguished in seconds. This piece was adapted with permission from The Forest Unseen: A Year’s Watch in Nature, published by Viking, an imprint of Penguin Publishing Group, a division of Penguin Random House, LLC. Copyright © 2012 by David George Haskell. Haskell’s work integrates scientific, literary, and contemplative studies of the natural world. A former Tennessee Professor of the Year and Pulitzer Prize finalist, Haskell he teaches courses in nonfiction writing, biodiversity, evolution, and conservation. Five Sewanee students have received good news and national recognition this spring: they have been awarded a Watson Fellowship, three Critical Language Scholarships, and a Newman Civic Fellowship. January marked the beginning of the Sewanee Food Literacy Project, a semester devoted to empowering and engaging students to help them make informed choices. Scholarship Sewanee is the university’s annual celebration of student scholarship, research, and creativity. 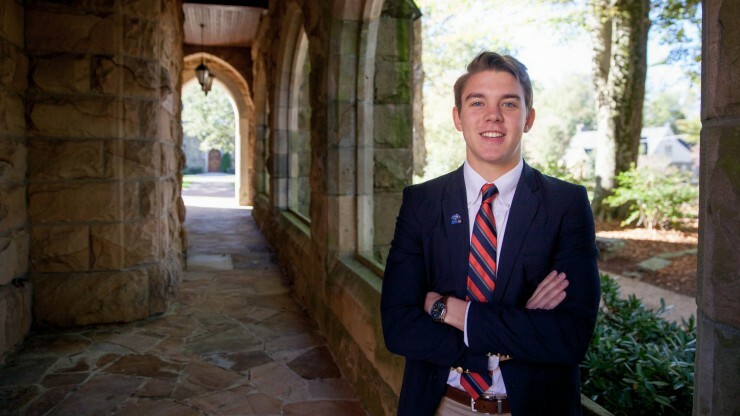 This popular visit weekend lets you see what it's like to be a Sewanee student. Two Sewanee students, both Natural Resources majors, spent the 2018 fall semester at sea aboard a tall ship ocean research vessel. NASA scientists were also along for the trip.